Why does Dave Ramsey Recommend Forth Hoyt as a Certified ELP Local Provider? In our modern world, it’s become increasingly complicated to find trustworthy and competent investment advisors, realtors, insurance agents or tax services. There are too many lazy businesses and too many unfulfilled promises. We decided that Dave Ramsey fans deserved better. We wanted his fans to be able to quickly find an accomplished professional they can trust—a pro who gives the same helpful advice our fans expect to hear from Dave. That’s why we created the Endorsed Local Providers (ELP) program—a network of endorsed professionals who are held accountable by members of Dave’s team and customer reviews. What started as a service for one city has now grown to help hundreds of thousands of people across the nation. People love our simple process and the high-quality professionals we endorse. Dave’s audience depends on us to provide reliable, trustworthy professionals who provide exceptional customer service. It’s a responsibility we take seriously every day. On top of that, we evaluate the performance of all ELPs every month to make sure we recommend you to the best agent possible. Also, every person who uses an ELP has a chance to grade them based on their personal experience through surveys we provide. We make sure each of our ELPs truly has the heart of a teacher, so you can trust your ELP to provide top-notch customer service. No one likes to be talked down or made to feel as if they don’t matter. Our ELPs take pride in the fact that they treat each Dave fan like a friend. It’s simple! If this program didn’t benefit you, we wouldn’t do it and that is why you should use a real estate agent that is an ELP. It’s a fact that people who use a good agent sell their home faster and for more money. In fact, a study by the National Association of Realtors shows that people who use an agent sell their homes for 16% more than people who don’t. Trying to sell your home yourself or using an inexperienced agent can cost you thousands more, not including time and frustration. 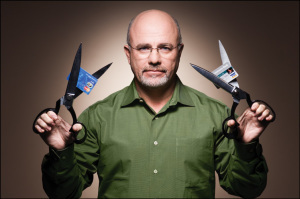 This entry was posted on Saturday, October 4th, 2014 at 8:47 am	and is filed under Dave Ramsey. You can follow any responses to this entry through the RSS 2.0 feed. Both comments and pings are currently closed.